This should be fairly obvious (and already stated) – it provides a way of monitoring the opinion of your customers for your brand and thanks to the likes of Twitter and Facebook, this monitoring can be near real-time giving you up to date analysis 24/7 of what people think about you. Imagine you had access to thousands of tweets (for this example and the implementation we will focus on twitter but could any others or more than one source), each having been painstakingly categorised as either positive or negative (thankfully datasets on almost any topic you can think of is available somewhere on the internet, and normally free – for this example we used data from http://www.cs.cornell.edu/people/pabo/movie-review-data). Now we have our data, we can harvest it – by this I mean iterate through each (either in parallel, MapReduce gives you a nice structure to use, or sequentially) throwing out words that add little value (normally referred to as stopwords – given that the English language normally contains 75% of redundant words this is an important step and removes a lot of noise) to extract features (elements that are used for assessment). Another way to filter out noise is to use the most frequently used words for a particular category given they are not common across all categories. Once we have filtered out all the noise we use the remaining ‘dictionary’ to create a feature list – with this we now construct a feature list for each tweet e.g. if our feature set was “bad ugly terrible great good loved” and tweet “I loved the movie, great to watch on Saturday”, we would have the feature set “0 0 0 1 0 1”, “positive” (here we also include the category it belongs to”. We can now use our feature sets to train our model, in this implementation we’re using a Naive Bayes Classifier, which is a probabilistic classifier i.e. the category (positive or negative) is derived from finding the probability based on the trained data (what we just did) given a set of features. Depends on the context you are using it and how accurate you need it (as this will determine what features you’ll extract and the sample size needed etc). I read once that the Naive Baynes Classifier can predict almost anything given enough data and the right features. When creating a model you normally test by removing (randomly) 10% of your training data to reserve for testing (normally repeated a few times). In our implementation we tested 10 times with 10% of the training data and achieved around 84% accuracy. It’s worth noting that the Naive Baynes Classifier is called Naive for a good reason; it treats each feature independently e.g. “don’t see this movie this weekend” and “don’t see any other movie this weekend” obviously mean different things, but if we treat don’t as a feature and give it a high weight for the negative category then these two tweets will be classified the same. You could of course use a more sophisticated feature extraction techniques such that you capture 2 or more words but given the brevity of tweets, independence with a large training set should suffice. 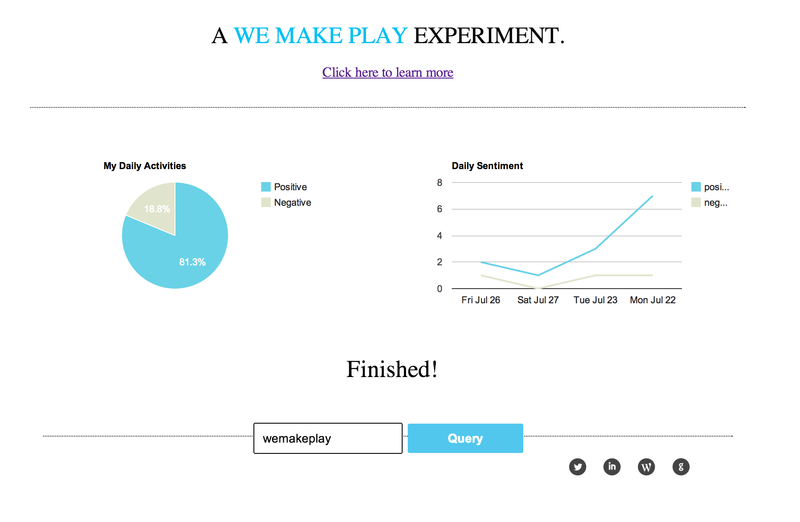 NB: The Sentiment Analysis service developed by We Make Play is an experiment/prototype – it will break and accuracy is variable.